The Lincoln Road Mall Miami Guide puts a personal assistant in the palm of your hands. Get detailed listings and maps for retail stores, restaurants, bars and clubs, banks, hotels, and entertainment options. If shopping makes you happy, we've got your paradise! Come and experience Lincoln Road Mall like never before, and best of all it fits in your pocket. If you’re looking for a last minute outfit, wanting to pass the time or simply looking for restaurants and entertainment, the Lincoln Road Mall is now right at your fingertips. Love to shop? 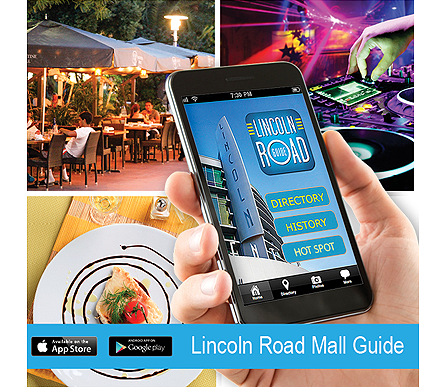 The Lincoln Road Mall app has everything you need to get the most out of your shopping experience. Miami Beach is known for two things: shopping and the beach. Those who love to shop know that the trendy shops are all located in the Lincoln Road Mall. This pedestrian mall is loaded with plenty of the finest boutiques and small eateries that attract not only locals but also those who are visiting from out of town. It is an enormous mall; navigating it and still managing to keep your sanity can be a task in and of itself. This is why there is the new Lincoln Road Mall App. There are a variety of restaurants in the Lincoln Road Mall, and there are a few that are specific to the locals. This does not mean you cannot find something you love. Balans – European cuisine meets the modern flair of Miami Beach. Sit on the sidewalk and watch the beautiful people go by. There are umbrellas available to shade customers from the sun or the rain. Books & Books Café – Food and books. Many cannot find a better match, and it is there in Miami Beach. Find all three daily meals available. Cuban – There are two: Yuca Restaurant and Abuela’s Kitchen. Authentic Cuban food. This is only a small percentage of the restaurants available. Those who are planning on eating should use the app to plan ahead. And a host of specialty stores as well. Best of all, the Lincoln Road Mall app will cover all of this for you. Shopping for things that you love or the ones you need always go with something to eat, especially if you are on the road filled with retail stores one after another. If you are going to spend an entire day shopping for the things you need, your day will never be complete without food. Food is necessary in order for the brain to function normally and stabilize your mood while looking from one shop to another. You need to keep your energy always up by filling food from restaurants or cafes that you find along the way while shopping. Such places can be found down the Lincoln Road Mall, a place filled with various shopping malls coupled with cafes and restaurants of different cuisine. If you want something locally made yet has a touch of a European cuisine then Balans Restaurant is the place for you. It has tables situated at sidewalks where the hip and trendy meet up. These tables are shaded to protect customers from the heat of the sun or when it rains. Other American based restaurant are Shake Shack, Nexxt Cafe and 5 Napkin Burger. If you want something peaceful where you get to enjoy the books that you bought from the same store then Books & Books cafe is the place for you. They serve breakfast, lunch and dinner located in 927 Lincoln Road. Other casual restaurants for peace loving customers are Serendipity 3 and Icebox Cafe. For Cuban type of food there is the Yuca Restaurant, Havana 1957 and Abuela’s Kitchen. There is only one French restaurant here which is the Crepes Etc located at 1120 Lincoln Road. For German type it is the Hofbrau Munchen situated at 943 Lincoln Road. There are a number of Italian restaurants in Lincoln Road Mall. To name a few there is the Cantinetta, Dal Toro, Locanda Sibilla, Rosinella, Segafredo Espresso, Soprano Cafe, Sosta, Spris and TiramesU. Specialty restaurants are a must if you want something different from what you can see with a traditional restaurant. The ones you will see in Lincoln Road are Haven Gastro Lounge, Nespresso, Paul’s Bakery, Starbucks Coffee and Tasti D-Lite. Since there are so many restaurants to choose from you will never go hungry when you plan on shopping down the Lincoln Road Mall. A bit of advice before venturing this great place: plan ahead to avoid wasting time choosing where to eat. Miami Beach, FL- Lincoln Road Mall, located in the heart of South Beach in tourist-centric South Florida, was named after Abraham Lincoln by the founding father of Miami Beach, Mr. Carl Fischer. The iconic road is over 100 years old and attracts people of all ages and backgrounds. On any day of the week, you will find crowds of pedestrians making their way up and down the stretch between Washington Avenue and Alton Road. By the 40’s, Life Magazine declared Lincoln Road Mall “Luxury Lane”. Described as the Rodeo Drive of South Beach, Lincoln Road catered to the elite class who arrived to the strip in their stretched limousines to shop at resident stores like Saks Fifth Avenue, Harry Winston Jewelers and Bonwit Teller. Decades later, after losing popularity and business declined, Founteineblueau and Eden Roc legendary architect Morris Lapidus was contracted by the city to revamp the strip in 1959. Lapidus immortalized the road by adding fountains, pavers, gardens and grand shade structures in his well-known and highly esteemed Miami Modern architecture (“MiMo”) style. Lincoln Road became one of the nations first pedestrian malls after Lapidus made the bold decision of closing the road to traffic. Lapidus exclaimed, “I designed Lincoln Road for people- a car never bought anything.” Doug Kennedy of the Miami Herald reported on November 14th, 1960, “ Mall-most ready. The spanking new Lincoln Rd. Mall will open late this month — an ultra modern shoppers’ haven built at a cost of a half-million dollars. The mall runs from Washington Ave to Alton Rd., and will be a shopper-stroller center free of burdensome automobile traffic.”. For most Miami Beach locals today, the site of the 1980’s mostly vacant strip, flooded with pigeons and elderly people being hauled around in tram’s is not far from memory. At the time, the big Lincoln Road giants were stores like Woolworth’s, Burdines and the unforgettable landmark, the Bank of America building with it’s large clock that has been the area’s time teller for decades. With the exception of the occasional in-line skater or the chanting of a passing Harikrishna, the strip was a ghostly abyss of closed shops and stuffy doctors offices for the sunny South Florida retiree. As South Beach regained it’s popularity throughout the 90’s to today, Lincoln Road has been home to legendary institutes like the Miami City Ballet, Lincoln Theater, Colony Theater, New World Symphony, South Florida Art Center. Today, Lincoln Road mall is a melting-pot of frou-frou stores like Armani, Banana Republic, and Versace mixed with more commercial stores like Forever XXI, H&M, and the Gap. The strip would not be complete without it’s vast array of restaurants for every foodie from cozy cafe’s to timeless restaurants like Rosinella and Yuka Restaurant. Lincoln Road is also filled with not so secret treasures like Books and Books, Miami Beach Community Church, and a weekly farmers market.